Joyce Glasser reviews Brad’s Status ( January 5, 2018) Cert. TBC, 101 min. As far from Hollywood as Ben Stiller dare ventures in his critically uneven, but financially successful mid-career, he has found his niche. 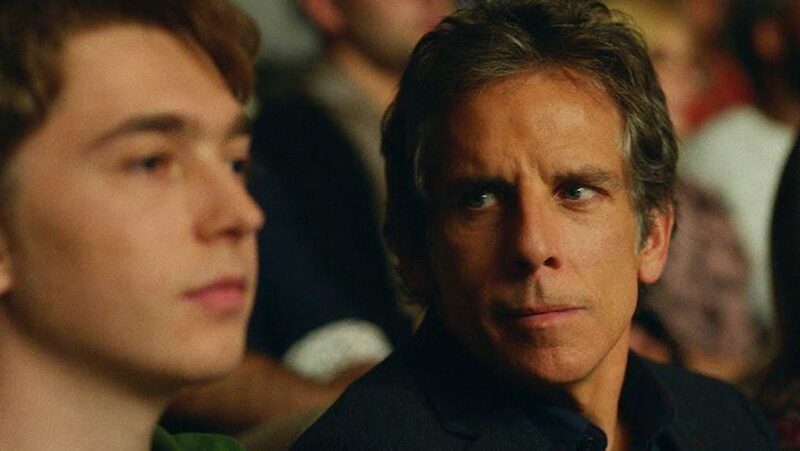 Stiller has epitomised the disaffected, white middle-class, middle-aged, self-absorbed male in Noah Baumbach’s low-budget comedies: Greenberg, While We’re Young and The Meyerowitz Stories. Now Mike White, an actor, Hollywood scriptwriter (Beatrix at Dinner and School of Rock) and sophomore director, has given Stiller arguably his meatiest role and most daring role yet in the clever satire Brad’s Status. 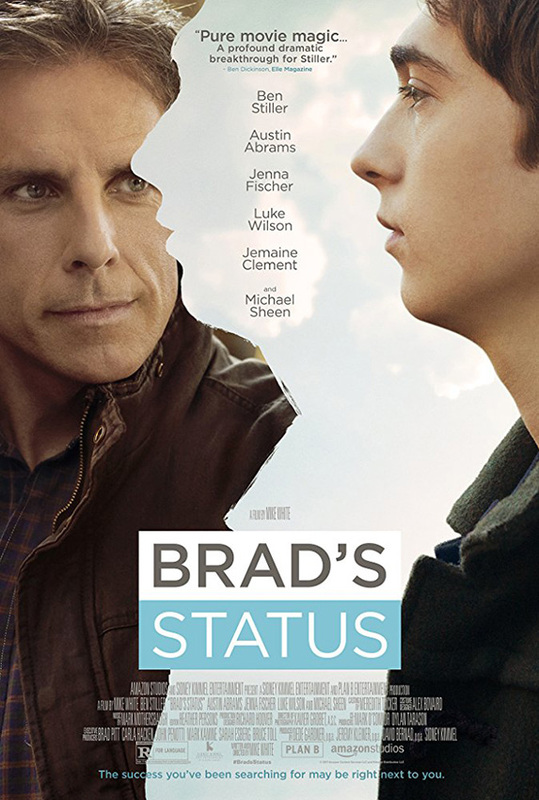 As he prepares to accompany his musically gifted son Troy (a great performance from Austin Abrams) from suburban Sacramento to Boston for interviews at Harvard, 50-something-year-old Brad Sloan is kept awake by the realisation that for him, there is no more potential – he’s played his hand. When his thoughts should be focused on his son’s Harvard application, he is talking himself into a mid-life crisis. In many respects, then, Brad is a slightly older, more neurotic and bleak version of Josh in While We’re Young, but the two films are quite different as Brad is so terribly – and hilariously- self-aware. This is not a crisis that he can attribute to family life. His attractive, sympathetic, career-minded wife Melanie (Jenna Fischer) laughs affectionately at his worries and reassures him that life is good and they want for nothing. Far from comforting him, Melanie’s contentment annoys Brad, as though her limited ambition has stymied him. Idealistic Brad, who heads up a charity clearance business, no longer derives comfort from the knowledge that, unlike his closest college mates, he did not sell-out to the establishment. Now, however, Brad is having doubts and he is comparing himself with his financially successful and estranged former friends. In comic day-dreams he imagines the dream lives of these friends. Craig (Michael Sheen), is a Harvard lecturer, celebrity author and White House adviser; Jason (Luke Wilson), is a wealthy entrepreneur with a well-connected wife and a private jet); Billy (Jemaine Clement) is a dot-com millionaire with women on each arm and a glamorous beach house and Nick (White, the director himself) is a gay filmmaker whose flamboyant house was featured in Architecture Digest. These sell-outs may not have changed the world for the better, but Brad hasn’t either. When one friend points out, instead of always begging for money, it’s better to make your own fortune and give it away, his statement hits Brad like an epiphany. Brad has always gone begging on behalf of good third-party causes. Now, however, to help Troy he will have to swallow his pride and go begging to estranged classmate Craig who has the vital Harvard contacts that his son needs. The father-son relationship is delicately nuanced and instead of clichés, there are some brutally frank observations. Brad, who at first can’t quite believe that Troy is Harvard material and wants to soften the blow should he be rejected, tells him that his alma mater, Tufts, was not his first choice either. Brad had his heart set on going to Yale, but was not accepted. Then, awkwardly, it dawns on Brad that Troy not only has an interview set up, but has a very good chance of being accepted due to a recommendation. White ensures that we notice Brad’s subtle reaction to the sight of his son’s bare torso in their shared hotel room, as though he had never noticed his little boy growing up. And when Troy introduces his father to Ananya (Shazi Raja) a student at Harvard and musician whom he knows, Brad finds himself flirting with her. Brad is not a bad father, but neither is he the clichéd, selfless and wise father who is happy to recede into the background with an ‘I’ve had my chance, now it’s his turn’ smile. Troy is mature enough to recognise his father’s foibles and view him objectively. But we can nonetheless see the relief mixed with surprise on Troy’s face when Brad uses a personal contact to get Troy out of a serious bind. While Brad has to swallow his pride in the process of helping Troy, the dreaded reunion with celebrity author and Harvard professor Craig Fisher turns out to be a revelation. Brad is not incorrigible. White gives his unlikeable character a redemptive character arc, while Stiller‘s painfully honest performance brings out Brad’s vulnerability and a bit of empathy. 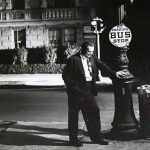 In that respect Brad’s Status turns out to be a feel-good film, but one that has left an indelible note of sadness on anyone still seeking fulfilment when time has run out. Using a running first person narration is a risky undertaking and at times you want the verbal navel-gazing to stop so that we can watch Brad’s reactions rather than listen to them. The sheer quantity of narration would have been irritating were it not so perceptive and intelligently written.